A new shipment from Vanilla is on the way, and we should have more of the Vanilla Junior skates in stock by February 7. We don’t know for sure which colors and sizes, but it should fill a lot of the holes in our inventory. The Skate Mate Trainers are a great way to help kids gain confidence at the rink while at the same time helping rinks make some extra money. They’ve been a huge success, with most rinks ordering extra Trainers a couple of weeks after their first purchase. They’ve announced their first price increase in several years. We’re holding the original price until February 11, but after that these will go up. If you’re interested, please get an order in before the increase. 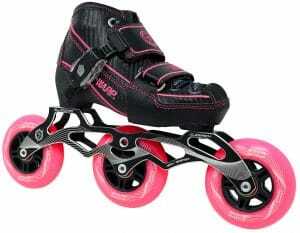 We are pleased to announce a new inline speed skate for smaller skaters. 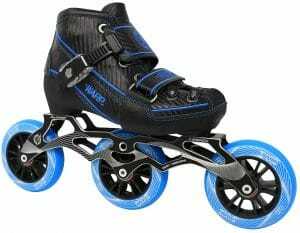 The Warp skate is their first product and it is an adjustable youth inline speed skate. These are not here yet, but should arrive the first week of February. They come in blue or pink. We’ll have a few more details once these arrive. There is a new documentary movie about roller skating that is generating some excitement. It is produced by John Legend and has interviews with Salt N Pepa and Coolio, so some big names are involved. It will air on HBO on Feb 18 at 8PM Eastern (and we’re guessing they’ll have other showings also). We do NOT know what it is rated or much about the contents. But with names this big behind it we feel like it has a real chance of generating some excitement. We’ve posted a link to a preview of the movie on our facebook page here. Feel free to forward that post on or tag friends in the post to try to generate some momentum within the skating community.